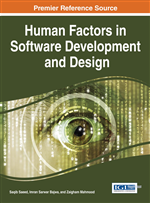 This chapter presents a Model to Estimate the Human Factor Quality in Free/Libre Open Source Software (FLOSS) Development, or EHFQ-FLOSS. The model consists of three dimensions: Levels (individual, community, and foundation), Aspects (internal or contextual), and Forms of Evaluation (self-evaluation, co-evaluation, and hetero-evaluation). Furthermore, this model provides 145 metrics applicable to all three levels, as well as an algorithm that guides their proper application to estimate the systemic quality of human resources involved in the development of FLOSS, guide the decision-making process, and take possible corrective actions. Level 0- Dimensions: Defined by internal aspects and contextual aspects of the product, the process and the people. Level 1- Categories: Defined in the human aspect are: individual, team and organization. Level 2- Characteristics: Each category has specific characteristics associated with it. The individual has seven characteristics associated with it. The team has four characteristics and organization has four characteristics. Level 3- Metrics: The human perspective proposes 128 metrics to estimate its quality. Contributions by various authors are also included and aspects that software developers should have have been classified as individual and teamwork-related. Individual aspects that software developers should have include voluntary work and motivation, according to Somerville (2006), and labor skills according to Marelli (2000). In teamwork-related aspects, the mechanisms proposed by Crowston (2010) to coordinate FLOSS development were taken into account. These mechanisms highlight the presence and skills of a leader, communication as analyzed by Pressman (2006), and evaluation of human behavior based on ethics according to Montuschi (2002). Ethical values presented by Himanen (2004), which are present in the hacker’s behavior, are also underscored.